"I am truly honoured to be here tonight. This trip is a bit of a homecoming for me. It is my first trip to India since being sworn in as Minister of National Defence by Prime Minister Trudeau in November 2015. I was born in the village of Bombeli in the Hoshiarpur district of Punjab and my parents emigrated to Canada when I was 5 years old. I have so many fond memories of my childhood in India. I cherish these memories and my Indian roots. And I use every opportunity to teach my children about their heritage. And as much as I am proud of my heritage, I am also a proud Canadian. I have served Canada in many different roles. I was a police officer in the Gang Crime Unit in Vancouver, tackling organized crime and drug violence. I also served as an officer in the Canadian Armed Forces. I served in Bosnia, and had three combat deployments to Afghanistan, where I was decorated by both the Canadian and U.S. militaries for my actions in fighting terrorism and the Taliban. And today I now serve as a member of Parliament and Canada’s Minister of National Defence. Even with the great opportunities Canada has presented me, it gives me great pleasure to say… I was born in India. Ladies and Gentlemen, I am no stranger to conflict. On my first deployment to Kandahar in 2006, I was the architect of Operation MEDUSA where we removed 1,500 Taliban fighters off the battlefield…and I was proudly on the main assault. It turns out we did not address the root causes of the problem. The work I undertook in this field has given me knowledge. Knowledge that I now bring with me in my role as Minister of National Defence. Giving me a unique perspective on modern conflicts. I would like to take a moment to pay tribute to the Foundation’s work in the area of defence and security. It is truly a privilege to be here with you today, in the company of some of India’s greatest strategic thinkers and policy leaders. Given India’s importance in the Indo-Asia Pacific region, this trip is an important opportunity to build and stregthen our bilateral relation, especially as it relates to defence. I am exploring working together in the areas of naval cooperation, cold climate warfare, joint exercises, counter-terrorism, and sharing advances in defence research and innovation. I am also interested in opportunities for Canada’s defence industry to develop closer ties with India. This is an area where we can benefit from each other’s expertise. As Canada’s Minister of Defence, I believe strongly that collaboration among partners and allies is crucial to strengthen global peace and security. In this respect, Canada and India have a strong foundation on which to build. Our countries have significant people-to-people ties and have enjoyed longstanding bilateral relations. A relationship based on shared values and traditions such as democracy, pluralism, and respect for the rule of law. Canada and India are also important trade partners – in sectors ranging from agriculture and education, to entertainment and energy resources. The strategic partnership between our nations is evident given the many recent visits by my cabinet colleagues. Prime Minister Trudeau and Prime Minister Modi have also engaged in dialogue, including at the Nuclear Security Summit in Washington last year. These high-level engagements speak volumes about Canada’s recognition of India’s importance in today’s dynamic environment. India has made major contributions to peace operations by sending battalion groups, engineers, medical teams, observers and staff personnel on some of the most challenging peacekeeping missions in history. Indian troops have served in Cambodia, Sierra Leone, Rwanda, Ivory Coast, Western Sahara, and several other places. In fact, I had the pleasure of meeting several Indian Peacekeepers in Goma last summer. I was inspired by their experience and valued the insight they provided me. Over 220,000 Indian troops have participated in United Nations peacekeeping missions, more than any other country. Your contribution is remarkable. But it has come at a great cost. 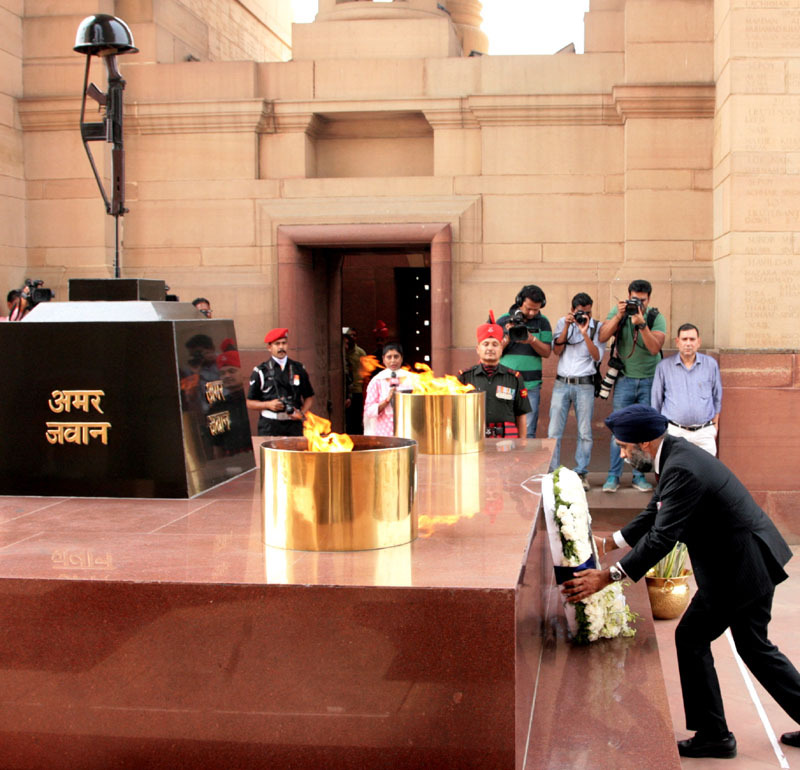 Unfortunately, 165 Indian soldiers have made the ultimate sacrifice in support of peace. The international community is forever indebted to them for their sacrifice. Like India, Canada also has a proud tradition of peacekeeping, dating back to Prime Minister Lester B. Pearson. Some 120,000 Canadians have served in more than 50 UN operations – from Cyprus to Cambodia and, more recently, in the Democratic Republic of Congo, Haiti and South Sudan. It was Pearson who first promoted the creation of a UN-led “peacekeeping” force in 1956 to resolve the strife in the Suez Canal. An achievement that earned him the Nobel peace prize, 60 years ago. But the peacekeeping of yesterday no longer reflects the changing nature of conflicts today. Today’s missions are often undertaken where there is no peace to keep. These missions are more about peace support and the protection of civilians than they are about traditional peacekeeping. Modern peace support operations take place in complex and hostile environments where belligerents are often not identified, civilians are being targeted, and arms, drugs and people are being trafficked. It is no secret that peace missions are under strain. Nor is it surprising that the UN has requested that countries with advanced militaries play a larger role. In Canada, we understand that evolving conflicts abroad have a very real impact on our national security and Canadian interests. Many other countries do as well. Since forming government, Prime Minister Trudeau has committed Canada to multilateralism more strongly than we have in many years. We have pledged troops and have launched our new Peace and Stabilization Operations Program, worth $450 million dollars. Our commitment also includes an increase of up to 150 police officers deployed to support UN peace operations. And our commitment doesn’t end there. Canada will be hosting the UN Peacekeeping Defence Ministerial meeting later this year. Canada has not only contributed to peace operations. We had many hard fought battles in Afghanistan. And Canada continues to make valuable contributions to several international missions right now, including in Iraq, Ukraine and soon in Latvia. In addition, Canada has been involved in the counter-ISIL core group where we continue to make significant contributions and have evolved our approach from a strategic military one to a more hocomprehensiblelistic approach. We know that military might alone will not resolve modern conflicts today. Conflict prevention requires a deep understanding of the root causes of the conflict. It is not enough to just send soldiers. The military buys you time to allow diplomacy and development to work. We also need to address the social and political factors that allow conflicts to fester in the first place. That is why Canada’s approach to conflict prevention and peace support is a whole of government effort. We believe we need to understand the fundamental causes of conflict, and learn from the experts who are working directly in the field. We also must be frank about what is working – and what is not working – and consider innovative approaches to international peace operations. In terms of innovative approaches, let me reiterate that the military alone will not be able to deliver security and restore countries to a peaceful state. I firmly believe that NGOs, international organizations and the business community are doing very important work in conflict zones. We can learn from their experiences and perspectives. I also feel strongly that we need to empower women in conflict and involve them in decision-making in security matters. I know this is an area where India excels. I applaud you for deploying the first unit composed entirely of female police officers in the UN to Liberia. We also need to support younger generations in their education and eventually, in their gainful employment. This is particularly the case in Africa, where close to 60% of the population is 25 years old or less. By working to address the root causes of conflict…by engaging other nations to work with us…and by supporting initiatives ranging from training to humanitarian assistance, development and education...we can maximize our contributions and increase our chances of success. All of these things are needed today to achieve international peace and prosperity. Let me say a few words about Canada’s efforts to renew its defence policy. Our government has been engaged in some deep thinking about our priorities and objectives over the past year. We recently undertook a comprehensive review of our defence policy to address emerging peace and security challenges. The review was rigorous and evidenced-based, involving unprecedented consulations with Canadians, academia and experts, Parliament, and our allies. Consultations of this magnitude have not taken place since the 1990s. This process explored three key topics. The first was to examine the main challenges to Canada’s security. The second assessed the Canadian Armed Forces’ role in addressing threats and challenges, now and into the future. The third area looked at what resources and capabilities would be required to effectively tackle these challenges. The input we received from consultations and our analysis of these key questions has informed a new policy approach that reflects the vision Canadians have for our country and where it is headed in the coming years. A policy that responds effectively to both the challenges and opportunities inherent in the world now, and into the future. I am in the process of finalizing Canada’s new defence policy, which I will soon be releasing. In closing, let me restate the importance of a cooperative approach in building a more stable world, and of doing this with allies and partners that share our interests and values. This is especially true in the Asia-Pacific, a region that has great importance to both Canadian security and prosperity. Canada’s innovation agenda and strengths in the defence and security sector can easily be overlooked. We are a humble country and one that seems far away from India. But Canada is as much a Pacific country and we are back on the world stage, ready to make a real difference…I firmly believe that Canada and India have much to offer in terms of defence and security. We share a commitment to peace support and conflict resolution. We live in societies that are diverse and built on democracy and the rule of law. This is my first trip to India as Minister of National Defence for Canada. It will not be the last. Thank you." NEW DELHI, APRIL 18, 2017: Canada’s Minister of National Defence, Mr Harjit Singh Sajjan, today emphasised the need for addressing the root causes of people’s discontentment to deal with issues of conflict. Delivering a special address on “Conflict prevention and peacekeeping in a changing world”, organised by Observer Research Foundation in collaboration with the Canada High Commission, Minister Sajjan, who himself is a war veteran having served in hotspots in Bosnia and Afghanistan, said military might itself cannot be able to address issues of conflict anywhere in the world. The Minister pointed out that the fact despite badly defeated in 2001, the Taliban could reemerge and became a big threat as the root problems of people were not addressed by the government and the Taliban exploited this for garnering people’s support. “I learnt a lot from experiences in Bosnia and Afghanistan. I reached this conclusion after talking to local people in the conflict regions,” Minister Sajjan said. He also pointed out that ISIS was a small group which went on to become a big threat to global peace, exploiting the resentments among the Sunnis and garnering their support. Saying that Canadian government believes in comprehensive tackling of conflicts with development assistance and grievance redress, the Defence Minister said his government will never enter any conflict zone without proper understanding of the problem and comprehensive package to address the issues. He said the issue is being discussed at the United Nations and soon expected some reforms in conflict resolution and peacekeeping which he said has changed now, from the earlier days. The Minister said he had talks with Indian Finance and Defence Minister Arun Jaitley today and his government is keen to increase cooperation with India on Navy, counter-terror and research and development of weapon systems. Welcoming the Minister, ORF Director Sunjoy Joshi suggested an India-Canada-Afghanistan joint initiative to address conflict issues in the region. “Once again as storm clouds gather, as nations committed to peace, the time is ripe for a joint India-Canada Afghanistan initiative, which moves beyond military solutions to create a holistic framework for the betterment of the Afghani people, which looks at ways of reconnecting the economic lives of people in the region with the region and the rest of the world”, Joshi said. Joshi said another area of mutual cooperation that arises relates to extremism, both the state sponsored variety as well as that perpetrated by non-state actors. India and Canada have a joint working group on counter terrorism and national security advisors dialogue. There is the ever present menace of online radicalism. There is a lot that our two nations can do to combat this through cooperation on cyber crime and cyber security, he added. 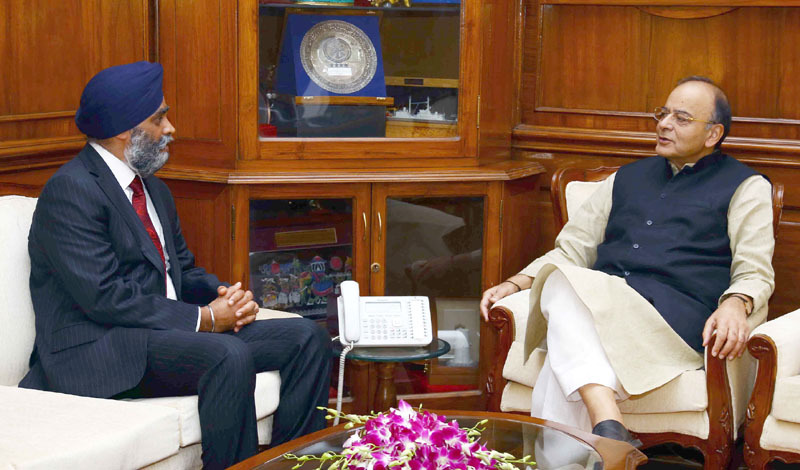 He noted that there is scope for increasing cooperation between our nations. Canada has a highly capable defence industry that is actively seeking business opportunities and partnerships around the globe. “India’s defense ties with Canada may yet be at a nascent stage, but we certainly stand to benefit from your nation’s technological skills, your considerable aerospace technologies, simulation and modeling technologies, cold climate expertise, your culture of research and innovation, all are Areas that suggest possibilities whereby Canadian defense manufacturers become an active part of the Make in India initiative,” he said.